At the Internal Affairs office, cameraman Squint is showing his boss, journalist MacIntyre, the footage he secretly took of April and Oyuki sneaking into the sewers. MacIntyre knows April is in league with the mutated turtles and is certain that if he follows her, he’ll get his story. Down in the sewers, April and Oyuki are telling Don and Raph about their latest story regarding a series of bank and jewelry store robberies. They figured the thieves might have been using the sewer tunnels for escape and decided to snoop around. Subsequently, they stumbled upon a giant pulsating glob of green tissue that looks like an Organ. Don and Raph check the weird thing out, finding crystallized rats scattered all over the place. Elsewhere, McIntyre and Squint are lost in the sewers. Happening upon the remains of a partially exploded tunnel, they find Scumbug, covered in tiny Wyrms and barely clinging to life. Wyrm had spent the last few years slowly sucking Scumbug dry to keep himself alive. But now that fresh meat has presented itself, Wyrm reforms to his full size and urges the equally hungry Scumbug to join him in the feast. MacIntyre and Squint make a break for it. Back at the pile of goo, Don discovers that it’s filled with gold bars and jewels from the recent robberies. Oyuki, meanwhile, discovers the resident of the slimeball; an alien thief/ugly spider-guy named Toxzeem. Toxzeem had planned on looting the Earth before its inevitable destruction and threatens “crystal death” to anyone who would get in his way. 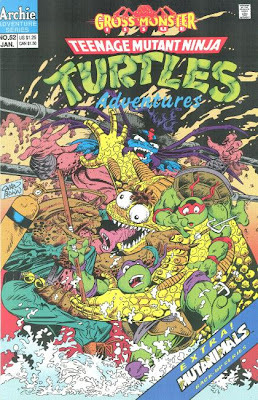 The Turtles take on Toxzeem and the fight leads them to a side tunnel, where they bump into the fleeing MacIntyre and Squint. Scumbug and Wyrm, meanwhile, bump into Toxzeem and decide to eat him, instead. Toxzeem isn’t intimidated and blasts them with his crystal death gun, turning the monsters into inanimate crystal statues. Raph destroys the gun with his sai, forcing Toxzeem to beat a hasty retreat back to his ship (that pile of goo). As the ship takes off, Don and Raph survive the blast of rocket heat by retracting into their shells and submerging in the sewer water. Alive but irritated, Raph grabs Squint’s camera and smashes it over his head. Don is just as angry with MacIntyre (if less violent about it), telling the douchebag that he’s in over his head and should forget he ever saw the Turtles. Don, Raph, April and Oyuki then storm off. Macintyre figures he might be able to salvage something from the story with the crystal monster statues, only to have them shatter the moment he touches them. Inside the volcano base, the Mutanimals have gotten their second wind and are wiping the floor with the villains. Heroic victory seems assured, but Dead-Eye disagrees. He proclaims that the Mutanimals’ defeat is preordained and the victory of the Gang is historically assured. 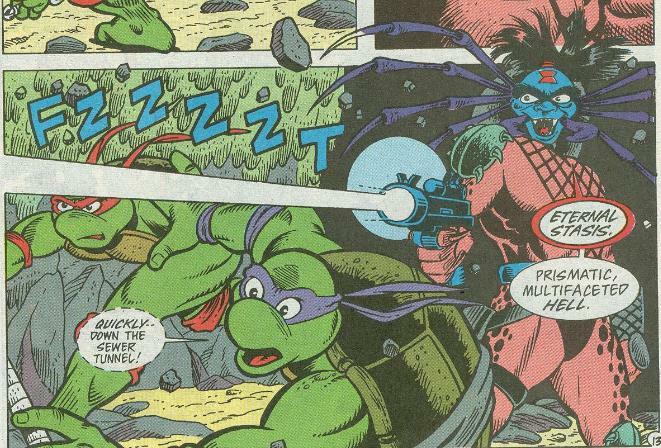 Using his vertigo ray, Dead-Eye incapacitates the Mutanimals. Then, claiming that they have done what they set out to do, Dead-Eye transforms his motorcycle into a hovercraft and the other three members of the Gang pile on. As the badguys escape, Future-Don tells Future-Raph that things are seriously messed up. The Gang wasn’t supposed to attack the Mutanimals for another two months. Someone is messing with the timeline. *This story is continued from TMNT Adventures #51. The story continues in TMNT Adventures #53. 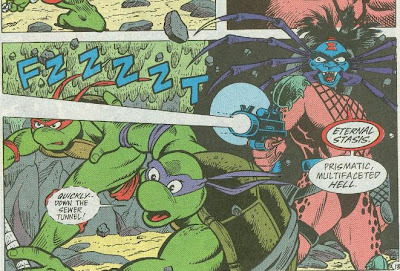 *Scumbug and Wyrm last appeared in TMNT Adventures #10. *McIntyre and Squint will return in TMNT Adventures #59. 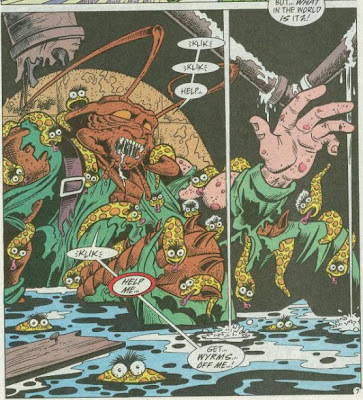 *Scumbug and Wyrm were originally planned to return in the third part of “The Forever War” (originally intended to be TMNT Adventures #73) but editorial and creative conflicts led to the cancellation of that storyline and the cancellation of TMNT Adventures altogether. *Toxzeem was a character originally created for the unproduced Mighty Mutanimals cartoon. *The Merdude miniseries takes place between this chapter of "Megadeath" and the next, acting as an interlude. *This story bore the dedication, “To Ryan Brown and the shattered days of old”. I mentioned before that TMNT Adventures #10 was the first issue of the series I ever bought, so I happen to disproportionately love that issue and the two monstrous villains it introduced. As you can guess, this sequel hit a nostalgic cord with me despite being pretty damn shallow and rushed. As you may or may not be noticing by now, Murphy (Clarrain) is killing time in-between the “Black Hole Trilogy” and the “Terracide” arc so as to let the “Megadeath” back-up finish. To fill the four issue gap, he’s basically taking us all on a nostalgic tour of the earlier issues in the series, reviving characters we all thought we’d never see again. Last issue gave us the Chameleon, the upcoming “Animus War” two-parter will bring back Katmandu and Al-Falqua, but this issue is my favorite in what you could call the “nostalgia arc” because… well… Scumbug and Wyrm. “Shattered” continues the MacIntyre subplot begun before the “Black Hole Trilogy” and offers some cryptic foreshadowing of a grim event that may destroy the Earth, but mostly it’s just a mad rush to bring Scumbug and Wyrm back from the dead so they can fight a boring alien thief that looks like a spider. And I love it. Chris Allan just rocks this issue and the sideways splash on page 17 is beautiful. Barry Grossman turns in some of his best coloring, too. On another note, TMNT Adventures’ design for Scumbug is awesome and it’s always such a disappointment to see how he turned out looking in the Playmates toyline and Fred Wolf cartoon. Likewise with Wyrm, who has a much goofier (and bluer) appearance in the Playmates line than he does in this comic (well, the mini-Wyrms are actually kinda funny-looking). Toxzeem, meanwhile, has a sweet character design while otherwise lacking anything approaching actual “character”. He’s a thief from space who uses a crystal ray gun and… yeah, that’s about it. The dedication at the end of the issue is rather sweet, reinforcing that this and the previous issue were meant as throwbacks to the days when Ryan Brown’s hand was more strongly felt in the book. 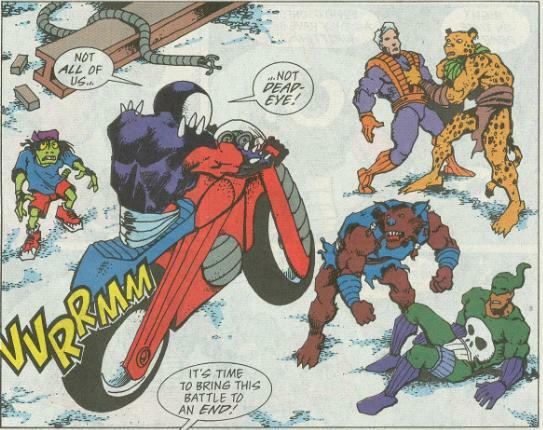 I’ve said before that I really like the initial (original) arc of TMNT Adventures, where it was just one Playmates action figure introduction after another, and forty issues later I am starting to miss those days a bit. So it was definitely some good timing on Murphy’s part to bring elements from those early adventures back when he did. As for “Megadeath”… there’s really so little to say about it at this point. Once it gets to the end, then I’ll have a mouthful to spew out. As of right now, it’s just plodding along. you get a really cool first "second" impression from scumbug in this number (not that the first was bad, but was more cartoony). it's closer to the way AC Farley drew him on the sourcebook, and you cant go wrong on that. Thanks for continuing the TMNTA reviews! So many good stories coming up!! I think that issue where Wyrm and Scumbug first appeared was one of my first, too! Dude, they were buried under that pile of rubble for years, I'm sure they spent time getting to know each other.